As I get older, I'm obsessed with making my eyes look as young as possible. Perhaps to their detriment, I smile. A LOT. So I do have some unsightly wrinkles at the outer corners, not to mention dark under-eye circles that won't disappear no matter how much sleep I get a night. I wanted to combat at least one of those issues ... so, enter the Kiehl's Powerful Wrinkle Reducing Eye Cream. This eye cream is formulated with a combination of micronutrients, Copper PCA and Calcium PCA that work together to both decrease wrinkles and improve texture and elasticity. I've been using this eye cream every night for the past three weeks and I'm here to tell you it WORKS. The wrinkles around my eyes have drastically and visibly (or not so visibly, as the case may be) reduced, leaving behind a soft, smooth expanse that puts me right smack dab in the middle of my 20's. The skin around my eyes feels firmer and less crepe-y and papery than before. I also really love the texture of this eye cream. It's whipped and thick, but not heavy or greasy. It sinks into skin immediately upon contact and leaves the eyes looking refreshed and rejuvenated -- a nice way to head into my eight or so hours of REM! I'm honestly shocked by just how much better my eyes look in such a short amount of time. I just can't get over how much younger and more awake I appear! 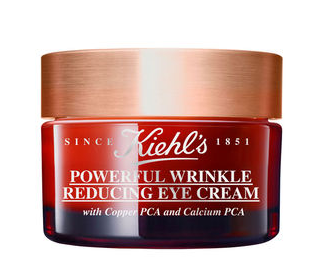 Kiehl's Powerful Wrinkle Reducing Eye Cream retails for $42 at kiehls.com. I have not been this thrilled by a blog post for quite some time! You’ve got it, whatever that means in blogging. Anyway, You’re definitely someone that has something to say that people should hear. Great wrinkle reducing eye cream product! I liked this product. Thanks fro sharing information on wrinkle problem. I use Revitol anti-wrinkle cream for my self.